It's teal week! I love teal-it's my favorite color so I've been looking forward to this week. First we are taking a look at Monteverde California Teal. I purchased my sample of ink from Anderson Pens. California Teal isn't quite a teal, it's closer to a green that leans a little bit blue. In large swabs you can see the beautiful dark pink sheen. Other properties: medium shading, high sheen, and no shimmer. Ink swabs for comparison, left to right (top to bottom for mobile RSS): Robert Oster Deep Sea, Monteverde California Teal, and Robert Oster Marine. When comparing California Teal against other teal inks, it looks much more green. 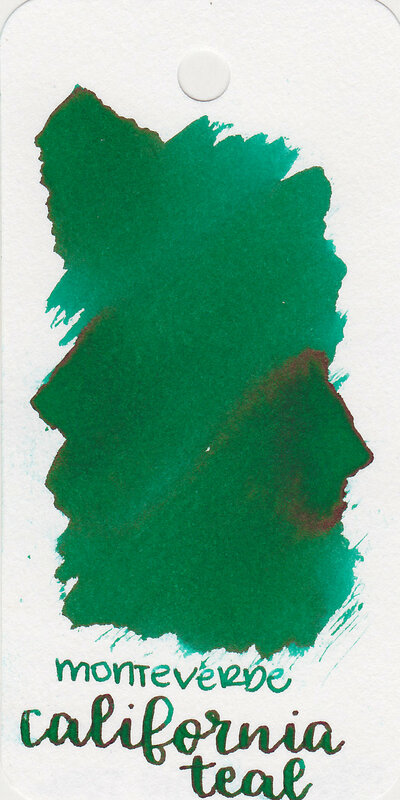 Monteverde Jade Noir, Robert Oster Peppermint, and Robert Oster Emerald. When comparing California Teal against green inks, it looks more teal. Click here to see the teal inks together, and here for the green inks. Overall, I enjoyed this ink. I really enjoy the flow of Monteverde inks, and they are one of the more affordable brands.